We rely on the durability and longevity of metal for critical applications, from production and manufacturing, to transportation and shipping. Because metal plays such a vital role in our lives, it is important to protect it from the elements. Unprotected metal will invariably corrode and rust over time, leading to damaged equipment and excessive time and money spent on repairs. 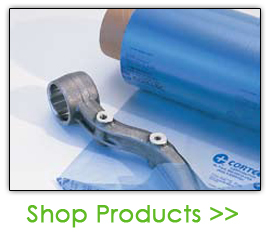 To stop the formation of corrosion and rust, ECORR Systems offers a full line of corrosion and rust inhibitors. The ultimate in corrosion protection, ECORR Systems products use the innovative Vapor-phase Corrosion Inhibitors (VpCI) to prevent the development of rust safely and effectively. The VpCI compound vaporizes upon application. It conditions the enclosed atmosphere with a protective vapor. The vapor migrates to all recessed areas and cavities. The vapor condenses on all metal surfaces. Ions dissolve and form a thin, monomolecular protective layer, made of water electrolyte, at the metal surface. This protective layer re-heals and self-replenishes through further condensation of the vapor. The VpCI can be combined with other functional properties including antistatic, coatings, paint removal, cleaning, fire retardant, polymeric, desiccant, lubricant, and rust removal. Because this compound is so environmentally friendly, VpCI products can be used in virtually any situation. With products designed for everything from household use to industrial applications, ECORR Systems corrosion and rust inhibitors offer safe, versatile solutions for your corrosion control problems. They are the only economical and ecologically responsible choice. To learn more about ECORR Systems extensive selection of corrosion and rust inhibitors, contact us via email at sales@ecorrsystems.com. To speak directly to a Sales Representative, call 866-830-4050.